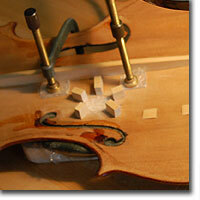 Qualified violin repairers are in great demand throughout the United States. They can work in fine violin shops and for instrument importers, in general music stores or for school districts. They may work with instruments that are centuries old and worth millions of dollars — or with the small-scale student instruments used by the youngest children in Suzuki programs. Violins are designed to be repaired. For example, the spruce top and the maple ribs and back are held together with hide glue. The glue is more brittle than the wood, allowing the entire instrument to be disassembled and reassembled. A quality instrument may last several centuries. The earliest violins date from before 1550 and an instrument dated 1567 is still in use today — a testament to the reparability and quality of these instruments. Basic repair and maintenance include rehairing bows, installing new bridges and sound posts, and making tonal adjustments. More complex challenges such as repairing major cracks or touching up damaged finish may require work over a period of several months or even years. The repairs themselves are repairable. Repairs made many years ago may require revision today; and repairs made today may be re-considered in the future. The techniques used by violin repairers have been handed down through the generations, yet new materials and tools provide constant opportunity to improve the process. Each instrument is unique and poses its own challenge. It is the job of the repairer to discover the best way to restore it, preserving its historic value and making it sound and play as well as possible.